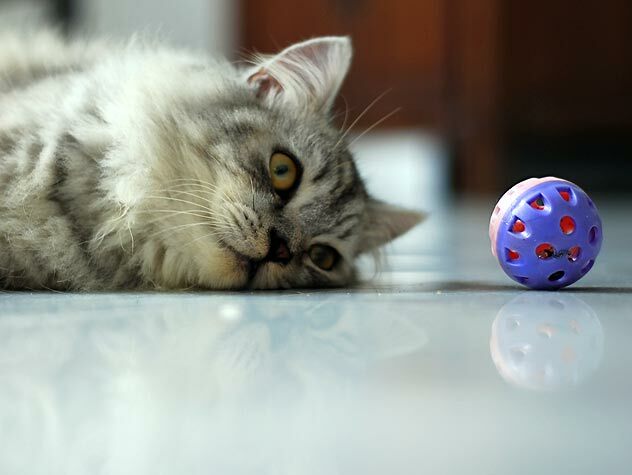 If you’re a proud and dedicated cat parent, a lot of different things go into loving your furry buddy, from making sure he gets sufficient interactive playtime to feeding him a nutritious and well-balanced diet. Dry commercial food is a strong dietary foundation for most cats. Before you decide on a dry formula for your cutie, however, make sure you’re aware of its caloric content. In “everyday speak,” kilocalories and calories are one and the same. 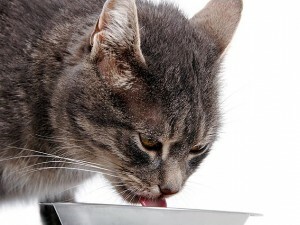 Some cats respond well to diets of just dry food, while others thrive on a mix of dry and wet. It’s up to you and your veterinarian to decide what food your cat should consume. “Balanced” or “complete” dry formulas are specially made to replicate the vital nutrients cats consume in nature, from carbohydrates to fats and proteins. If you see the words “supplementary food” on dry food packaging, that food doesn’t take care of a cat’s full dietary needs and isn’t suitable for main meals. As far as calories, dry food is more condensed and usually higher in calories than wet fare, according to veterinarian Arnold Plotnick. This means that cats can eat a small amount of dry food and still get as many calories as a larger serving of wet food. Calorie counts for dry cat food usually are between 350 and 500 kilocalories for single cups. Calorie counts for wet cat food are usually between 120 and 190 kilocalories for 5.5 ounce cans. Getting the calorie counts for dry cat food isn’t always as simple as turning the package around and looking at the label. Cat food manufacturers aren’t obligated to include calorie counts on packaging unless products are classified as being “light” in that department. Although informing customers of calorie counts isn’t mandatory for all products, some pet food manufacturers still do. Purina® Pro Plan® Adult Weight Management, for example, is a rice and chicken-based dry food with a caloric content of 427 kilocalories per cup. Some pet food manufacturers provide caloric information for all of their products on their official websites. Although the calorie count for the dry cat food of your choice might not be included on the packaging, you don’t have to stay in the dark about it. Look at the “Guaranteed Analysis” section of your bag of dry food. This list should provide the food’s specific percentage values for everything from fiber to crude protein. The website for the Feline Nutrition Awareness Effort organization provides a user-friendly calculator that can help you figure out not only the calorie count for your kitty’s dry food, but also its carbohydrate percentage. Not all cats have the same caloric needs, which are influenced by everything from age to level of physical activity. Growing kittens, for example, need to consume significantly more calories than average mature felines, according to author and feline expert Brigitte Eilert-Overbeck. Kittens should eat only dry food tailored to their age group. If you have an 8-year-old tabby who is a bit on the pudgy side, his caloric needs will be different than those of a much younger and trimmer cat. Your veterinarian will take your individual cat’s health and background into consideration and can recommend a daily calorie range. Find out why your adopted cat is constantly hovering around the food bowl, and tips to curb kitty's appetite.